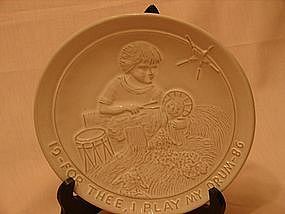 Frankoma 1986 Christmas collector plate. Frankoma 1986 Christmas collector plate. "For Thee, I Play My Drum" 8 1/2 inches in diameter. Mint condition. Marked Frankoma and signed by the artist/designer.